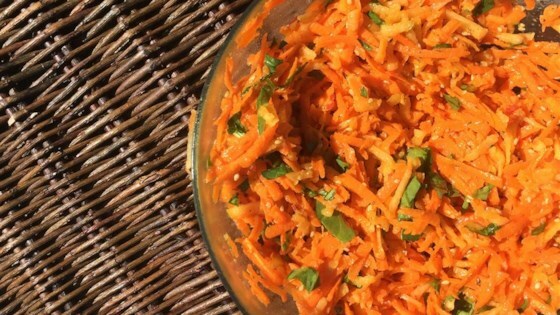 "This shredded carrot and apple salad is a delightful addition to your summer lunch." Heat a skillet over medium heat; pour sesame seeds into the hot skillet. Cook, stirring often, until sesame seeds are lightly browned and fragrant, 3 to 5 minutes. Remove from heat. Mix carrots, apple, toasted sesame seeds, and parsley together in a bowl. Whisk lemon juice, vinegar, sugar, garlic, salt, and pepper together in a separate bowl; slowly drizzle safflower oil into lemon juice mixture while continuing to whisk. Pour dressing over carrot mixture; toss to coat. Substitute honey or maple syrup for the sugar, if desired. Yummy & tangy. A great side dish. The only change that I made was that I did not have any safflower oil handy; used olive oil instead. The dressing was WAY too vinegar-y/lemony. My husband and I could barely eat it as that's all you could taste. Dressing overwhelmed any other flavors that might be in the salad.